Join us tomorrow night at The Newsstand on Main St. for this month’s Sourwood Reading featuring Alex Muller. Alex Muller has lived in one or more of the Carolinas for over a decade. 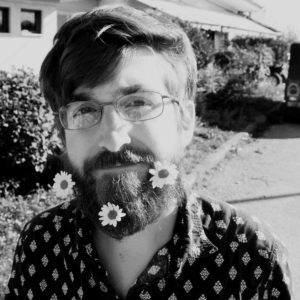 He graduated from Winthrop University in 2014, where he was the Editor-in-Chief of the annual literary and arts magazine, The Anthology, and invented a poetic form called the Motet. He received a Master’s degree in English Literature from Wake Forest University in 2016 and currently lives in Winston-Salem, NC. He is a sometime songwriter and lo-fi recording artist, recently releasing his third full-length album under the moniker This Is For My Friends. His poetry has appeared in Kakalak (2013, 2014) and The Rectangle. Note: The Come-See-Me parade will be happening at the same time so make sure to come early. The Sourwood Reading Series is a monthly series sponsored by The Sourwood Writers – Friday Arts Project’s poetry group – and The Newstand in downtown Rock Hill. This series features one poet to read followed by an open mic time. Any poets are welcome – time will be limited, but not tyrannical.